Source: “Shipments Share of 4, 8, 20, & 50 Largest Companies in each SIC: 1992–1947,” Census of Manufactures; and “Economic Census,” 1997, 2002, and 2007, American FactFinder (U.S. Census Bureau, 2011), http://census.gov. Notes: “Total revenues” (COMPUSTAT) and “total receipts” (SOI) are equivalent. Since the COMPUSTAT dataset contains only conglomerate-level data all foreign companies—defined as those not incorporated in the United States—were dropped. 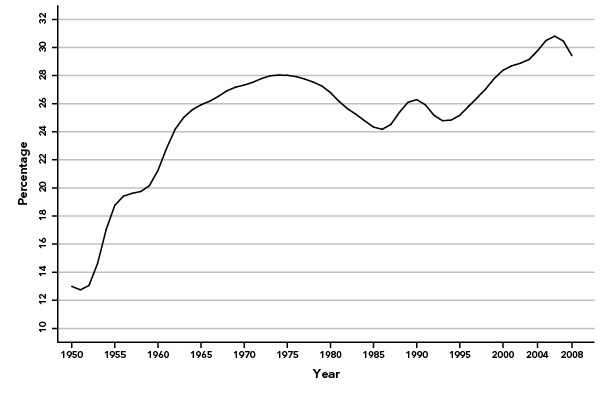 In this Figure, as well as for Figures 3, 4, and 5, a robust linear smoother was used so the line approximates a five-year moving average.COMPUSTAT data was extracted from Wharton Research Data Services (WRDS). WRDS was used in preparing this article. This service and the data available thereon constitute valuable intellectual property and trade secrets of WRDS and/or its third-party suppliers. 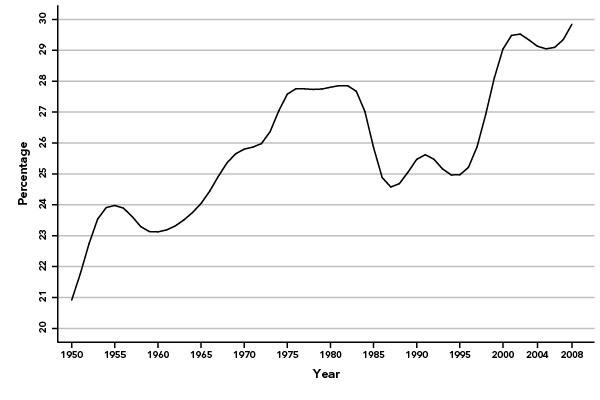 As Chart 5 shows, the total annual revenues of the largest five hundred corporations in the world (with operations in the United States and Canada) have been trending upward since the 1950s. In 2006, just prior to the Great Financial Crisis, the world revenues of these firms equaled about 35 percent of world income, and then dipped when the crisis hit. 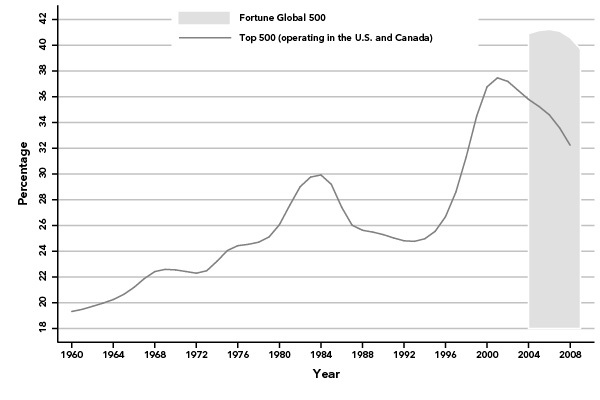 Over the last six years, Fortune has been compiling its own list of the top five hundred corporations in the world known as the “Global 500” (this consists not just of those global corporations operating in the United States and Canada, as in the COMPUSTAT data used in the longer time series, but also the top five hundred operating in the world at large). This shows Global 500 revenues on the order of 40 percent of world GDP (falling to around 39 percent in 2008). The percentages shown by these two series are highly significant. Were the five hundred largest shareholders in a company to own 35-40 percent of the shares of a firm, they would be considered to have the power to control its operations. Although the analogy is not perfect, there can be no doubt that such giant corporate enterprises increasingly represent a controlling interest in the world economy, with enormous consequences for the future of capitalism, the population of the world, and the planet. Financial corporations were to follow in subsequent decades in adopting multinational fields of operation. Indeed, a key question today in understanding the evolution of the giant corporation is its relation to finance. Here the classical Marxian analysis was ahead of all others. In Marx’s concept of the modern corporation or joint-stock company, the most important lever—other than the pressure of competition itself (and abstracting from the role of the state)—in promoting the centralization of capital, was the development of the credit or finance system. The rise of the modern firm, first in the form of the railroads, and then more generally in the form of industrial capital, was made possible by the growth of the market for industrial securities.59 Finance thus led to centralization. In 1895, just before his death, Engels was working on a two-part supplement to Marx’s Capital, the second part of which, entitled “The Stock Exchange,” remained only in outline form. 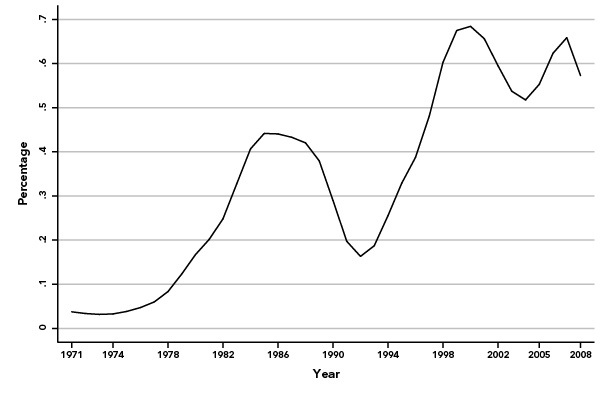 It started with observations on the rise of the industrial securities market, tied this rise to the fact that “in no industrial country, least of all in England, could the expansion of production keep up with accumulation, or the accumulation of the individual capitalist be completely utilised in the enlargement of his own business,” and saw this tendency toward overaccumulation as the general economic basis of the founding of giant capital and the acceleration of an outward movement toward world colonization/imperialism.60 Both Hilferding’s Finance Capital and Veblen’s The Theory of Business Enterprise focused on finance as a lever of monopoly. ↩ Joan Robinson, The Economics of Imperfect Competition (London: Macmillan 1933); Edward Chamberlin, The Theory of Monopolistic Competition (Cambridge: Harvard University Press, 1933). 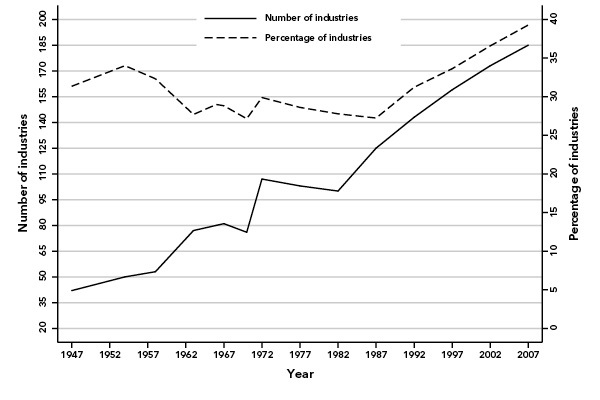 “Monopolistic competition” is often used in neoclassical economics to refer to a realm of small and medium firms, excluding almost by definition the typical firm structure of oligopoly. Chamberlin, who himself introduced the term “oligopoly” to economics, is clear that such a separation was not his intention. Edward Hastings Chamberlin, Towards a More General Theory of Value (New York: Oxford University Press, 1957), 31-42. See also Mark Blaug, Economic Theory in Retrospect (Cambridge: Cambridge University Press, 1978), 415. ↩ We are now seeing in just the last few years works bringing all of these elements together, making for compelling results. See Harvey, The Enigma of Capital; Amin, The Law of Worldwide Value; Michael Perelman, Railroading Economics (New York: Monthly Review Press, 2006); and John Bellamy Foster and Fred Magdoff, The Great Financial Crisis.